Steven Stamkos had a goal and an assist, Andrei Vasilevskiy stopped 29 shots, and the Lightning beat the Toronto Maple Leafs 3-1 Thursday night to become the second team in NHL history ot win more than 60 games in a season. Tampa Bay, which bounced back from a 4-2 loss at Montreal on Tuesday, has a chance to tie the 1995-96 Detroit Red Wings’ record of 62 wins in the regular season finale Saturday at Boston. Detroit’s record came before shootouts and the 3-on-3 overtime. Tampa Bay has six shootout wins this season. Nikita Kucherov and Alex Killorn also scored for the Lightning. Mitch Marner scored for Toronto, and Frederik Andersen finished with 26 saves. Tied 1-1 in the third period, Stamkos threw a pass back into the slot to Killorn, who beat a down-and-out Andersen with a fluttering shot into the top of the net for his 18th goal of the season with 5:48 left. The Maple Leafs pressed for the tie with Andersen on the bench, but Vasilevskiy stopped Patrick Marleau from in tight with his left pad on Toronto’s best chance before Kucherov sealed it with an empty-netter with 55 seconds left for his 40th of the season. The game in front of a crowd of 19,400 at Scotiabank Arena was meaningless in the standings with both clubs locked in their spots — Tampa clinched the Presidents’ Trophy for the NHL’s best regular-season record on March 18, while Toronto is cemented in the Atlantic Division’s No. 3 seed. The Leafs are set to open their playoffs next week against Boston at TD Garden, the same building where they lost in Game 7 to the Bruins in last spring’s first round. 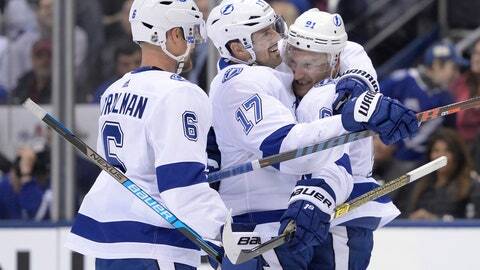 The Lightning will meet the Eastern Conference’s yet-to-be-determined second wild card. Toronto opened the scoring at 4:41 of the first period when Marner disrupted a Lightning attack at the Maple Leafs’ blue line, got the puck back from Zach Hyman to create a 2-on-1 break the other way and beat Vasilevskiy between the pads for his 26th. Andersen, who is looking to find his rhythm ahead of the playoffs after some shaky outings, made a terrific save on Mikhail Sergachev midway through the period, snapping his glove out to grab a quick shot off a feed from Kucherov. Vasilevskiy then flashed some leather at the other end, getting a piece of Marleau’s effort to keep his team within one through 20 minutes. The Lightning got even at 5:37 of the second with a short-handed goal. Stamkos took a long pass from Ryan McDonagh before snapping a shot glove side on Andersen that the Toronto goalie could only get a piece of for the Tampa captain’s 44th. Vasilevskiy stretched to deny Auston Matthews moments before that on a rebound off the end boards. Anthony Cirelli rang a shot off the post behind Andersen with the team’s playing 4-on-4 right off a neutral zone faceoff after Stamkos’ tying goal. John Tavares had a chance to put Toronto ahead off a spinning pass from Marner that Vasilevskiy got a piece of about six minutes into the third. Andersen denied Yanni Gourde and Brayden Point on back-to-back efforts off the rush. Vasilevskiy then robbed Tavares again with his glove with under seven minutes left. NOTES: Toronto D Jake Gardiner returned to the lineup after missing 18 games with a back injury. “Some relief,” Gardiner said of getting back into the fray. “It’s always tough when you’re sitting out with an injury and you’re not sure if you’re going to be able to get back.” … Maple Leafs F Andreas Johnsson was back after an illness kept him out of the previous two games. … Toronto D Jake Muzzin (illness), who also missed Tuesday’s 4-1 loss to Carolina, and Nazem Kadri sat out. Babcock said both players will miss the finale Saturday. … Toronto’s William Nylander centered the third line between Johnsson and Connor Brown. … Lightning D Victor Hedman sat out for a third straight game. Lightning: Close the regular season at Boston on Saturday. Maple Leafs: At Montreal on Saturday in the season-finale.